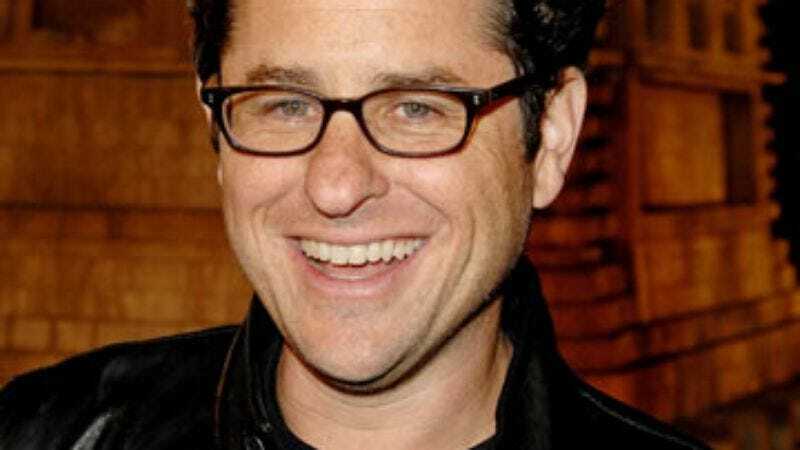 Writer-director-producer J.J. Abrams was born into a show-business family as the son of a TV executive, and he started his own career immediately after college, selling screenplays for Taking Care Of Business, Regarding Henry, and Forever Young while he was still in his 20s. He moved from feature films to television in 1998, first co-creating the collegiate drama Felicity, and then heading up the twisty 21st-century spy thriller Alias. In the '00s, Abrams has divided his time between movies and TV—and between offbeat fantasy and straight drama—having a hand in such disparate projects as Lost, What About Brian, Cloverfield, Six Degrees, Joy Ride, and Mission: Impossible III. While putting the finishing touches on the new big-screen version of Star Trek—due in theaters next summer—Abrams is also working with Robert Orci and Alex Kurtzman on the new science-fiction mystery series Fringe, which debuts September 9 on Fox. The A.V. Club: How do you generally feel when a new TV show of yours is about to première? Anxious? Confident? AVC: One thing about TV that's different than movies is that you can adjust as you go, and if you're on the air long enough, you can respond to the audience response. Do you pay a lot of attention to what critics and fans say when they write about your work? JA: Oh, sure. I mean, the noise you hear after people see something you do—whether it's a TV show or a movie—that always makes you see that thing slightly differently. Without question. The ability of a television series to make adjustments is something you've got to take advantage of. And test-screening a movie can be helpful too. But the part that can be dangerous is when you take those notes as gospel, instead of taking them with a grain of salt. The key is to use the response as one of the tools in your box, as opposed to using it to determine what you do. AVC: You didn't direct the Fringe pilot. AVC: Do you want to direct an episode? JA: Well, I'm hoping. Maybe a season finale or a season opener or something. I've been wanting to do it since the pilot. We have great directors working on Fringe, but when someone else directs something that you're involved with, it's always their vision, and the director in my head is definitely wanting to get involved. AVC: Which hat do you like to wear the most? Director, producer, or writer? JA: Directing's the best part. Whenever I've directed something, there's this feeling of demand and focus that I like. And secondly, it means that you've gotten through all the writing stuff, and the producing stuff, and casting, and prep, and all those stages that are seemingly endless. So directing is sort of the reward for all the work you put in before. And then there's the editing, which is another amazing stage of the process. It's incredible the moments you can create. AVC: Where do you think your strengths lie? JA: I wish I had a clue. [Laughs.] My guess is "nowhere," but I do the best I can. AVC: The pilot of Fringe opens up with an airplane in trouble, which is similar to the opening of Lost. Was that a conscious nod, or just a coincidence? JA: What happened was, we were discussing what the opening of the show should be, and we talked about so many different things, so when the plane idea came up, the last thing on my mind was Lost. Later, we realized it sounded an awful lot like what we did on Lost, but by that point, honestly, I thought, "Who cares?" It's appropriately creepy, and large enough in scale to fit the bill for an opener. AVC: How much day-to-day input do you still have on Lost? AVC: Do you watch the show as a fan? Are you surprised by what happens? JA: Oh yeah, I watch episodes, and I get the scripts. What's cool is that I was there when it was created, and now I'm watching it grow into something else. AVC: Back when you were doing Felicity, on the heels of writing movies like Regarding Henry and Taking Care Of Business, not many people would've pegged you as an SF/fantasy guy, but that's become a big niche for you. Is that something you'd planned all along? JA: Uh, I could not have less of a plan. [Laughs.] I've just been lucky to work on things that I felt would be cool to see. It's not that I had a strategy or anything. Growing up, I loved The Twilight Zone as much as I loved The Mary Tyler Moore Show. And I loved the Superman TV show when I was a kid, and Batman, and Speed Racer, and all the pop-culture icons that everyone in my generation lived on. But I also remember loving the version of The Hunchback Of Notre Dame with Charles Laughton. I watched it when I was 10 or 11, and was just sobbing over the story, while also being blown away by the makeup. My favorite things have nearly always been extreme and fantastical, involving some kind of visual effects, but also very emotionally driven. I loved Ordinary People, and The Philadelphia Story, and a lot of dramas and comedies based on plays that could not be farther from science fiction. And at the same time, I was obsessed with the horror movies of the early '80s and late '70s. So in the end, the things I've worked on professionally have really been whatever I've been lucky enough to get produced, not stuff that I planned out years in advance. AVC: How do you put your varied interests to work in a franchise like Star Trek, which has fans deeply devoted to certain immutable core elements? How do you make it yours? JA: Well, I was never the type of Star Trek fan that had expectations or limits about what the "right" version of a Star Trek movie should be. But at the same time, one of the reasons I got involved with Star Trek was because it has such devoted fans, so I felt it was critical to honor them and honor the series. I learned as much as I could about the show, and looked for help from Bob Orci, one of the creators of Fringe, who was also one of the writers of Trek, and an avowed Trekker. He knows all the arcane details, so he was the one kind of keeping me honest on the set. Ultimately, though, I wasn't making this movie just for the dedicated fans. I was making the movie for fans of movies. The final product, I think, doesn't require any prior knowledge of the show Star Trek. I mean, almost anyone, if you stopped them on the street and asked who Kirk and Spock are, they'd know. I think people will typically have some sense of those two guys. And then there are fans who know every episode and argue about what the Star Trek canon is. This movie does acknowledge a world that has pre-existed off the screen for decades, but when you see it, it's not going to be quite what you'd expect, and definitely not just a rehash of things you've seen before. It's a very new take on the thing that it's also beholden to. It's a very interesting balance. AVC: You grew up in a TV family, correct? JA: My father was a retail commercial contractor who became a TV producer, and then my mother became one later, after I went to college. When I was growing up, she was a lawyer. AVC: Did growing up in those surroundings demystify showbiz at all, or make it seem more exciting? JA: It completely demystified it in a way that was sort of strange. My dad had an office at Paramount, and so when I was 11, 12 years old, I would go to the office with my father, and I would wander around the lot. I got to know the guards who were there, so they'd let me in and I'd sit in the empty bleachers and watch Happy Days or Laverne And Shirley or Mork And Mindy. I vividly remember seeing Robin Williams in civilian clothes, rehearsing and doing a bunch of crazy accents. I remember watching Ron Howard and Henry Winkler and those guys, and it's a strange thing when you're a kid and there's The Fonz, such a hugely important part of your childhood. Yet you go to the set and see Henry Winkler, and in real life, he's nothing like The Fonz. It was disconcerting and confusing, but at the same time demystifying and fun. Really, it was great just watching my father, I would go to sets with my dad, and just watching what he did, seeing how production really works, asking adults questions… It's one of those things that's fueled me. I'd been making Super 8 films since I was 8 years old, and seeing how it was really done, even though I still didn't understand a lot of it, was something I could use. AVC: Having met Henry Winkler, can you still watch Happy Days and see The Fonz? Or do you just see Henry Winkler? JA: Well, I actually didn't meet him until a couple of years ago. I just watched him. But of course, once you know how it's done, once you know what it looks like when you're on a set, watching the finished product is no longer the same experience. It's like a magic trick. Once you know how that trick is done, it ruins the experience of watching it. On the other hand, there's a bigger thing that starts to happen, and you start to appreciate the presentation. Even though it's not the same anymore when you watch the show you were present for rehearsals for, or watch a movie that you were on the set for, you start to see another thing. It doesn't negate being entertained. AVC: If you look at a lot of the TV and movies you've been involved with, like Cloverfield or Lost or now Fringe, you seem to be trying as hard as you can for as long as you can not to reveal the trick. JA: I think that that's partially true. Like with Cloverfield, the whole idea with the marketing and the quick release was for people to have an experience as it happened, instead of pre-experiencing it by reading all about it. But I feel like with Fringe, the mandate is to try to do something week-to-week that's a procedural like CSI, but a skewed procedural, that's as creepy as humanly possible. While with Lost, on the one hand, it is a show that seems to duck answering questions. At the end of the pilot, you have Charlie asking "Where are we? ", and that's something the audience still wants to find out. But week-to-week, that show answers a lot of questions, just not always the ones people feel are the ones that matter. I think that even if you're wondering if two characters are ever going to kiss, drawing out the inevitability is part of the fun. Whatever the genre happens to be. Now in a movie, you get all the answers by the end, except in Pulp Fiction, where you don't ever really get to know what's in that case. But even in movies—a great example is North By Northwest, where you don't really know what the microfilm is, but who cares? By the end of the movie, the answer that you get is not really the answer that you thought you wanted to know. The answer you get is: "Oh, they're in love, and now they're married, and these were the circumstances that led up to that. They almost died a number of times, but they survived and they found each other," I feel like in telling stories, there are the things the audience thinks are important, and then there are the things that are actually important.